The 2014 ACC football season is right around the corner, and for the first time in over a decade and a half, the reigning Heisman trophy winner and national champions will be from the ACC. Florida State will be looking to repeat, and they are favored to do so according to most major polls. Jameis Winston is looking to be the first back-to-back Heisman Trophy winner since Archie Griffin in the 1980s. Winston will be under far more pressure this year as some of his favorite targets left for the NFL. This season also marks the return of Miami’s Duke Johnson. Johnson missed the end of last season after suffering a season-ending injury. Johnson is one of the best football players in America, and Miami will go as far as he carries them. Duke wide receiver Jamison Crowder looks to break several ACC records this season including career receptions and passing yards. Crowder played a key role in Duke’s ACC coastal division-winning season. Even though he is only 5 foot 9, he is one of the toughest and fastest players in the country. Crowder will be the staple of the Duke offense, and if they want to repeat last year, Crowder must have another 1000-yard season. 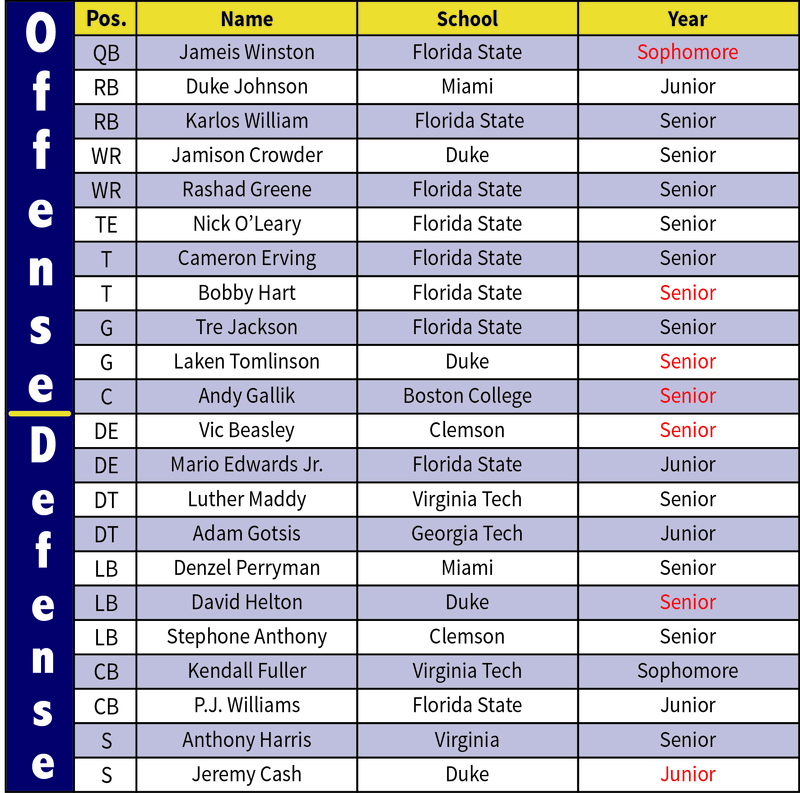 The Technique predicted its preseason All-ACC team, and leading the way with nine players was Florida State. Duke had four, and Adam Gotsis was the only Tech player to be named. The Technique preseason player of the year is Duke Johnson, and Vic Beasley is the preseason defensive player of the year. Jimbo Fisher has the nod in winning ACC coach of the year. Florida State is the heavy favorite to win the Atlantic division, but the Coastal division is wide open. 1. Florida State: Even though FSU lost many key players to the NFL, they still have the best offensive line in college football and plenty of proven talent on offense to win the ACC. However, FSU will have their hands full in the new College Football Playoff. 2. Clemson: The Tigers lost their 3 best offensive players this past season, but head coach Dabo Swinney has enough talent on the team for them to have another ten-win season. 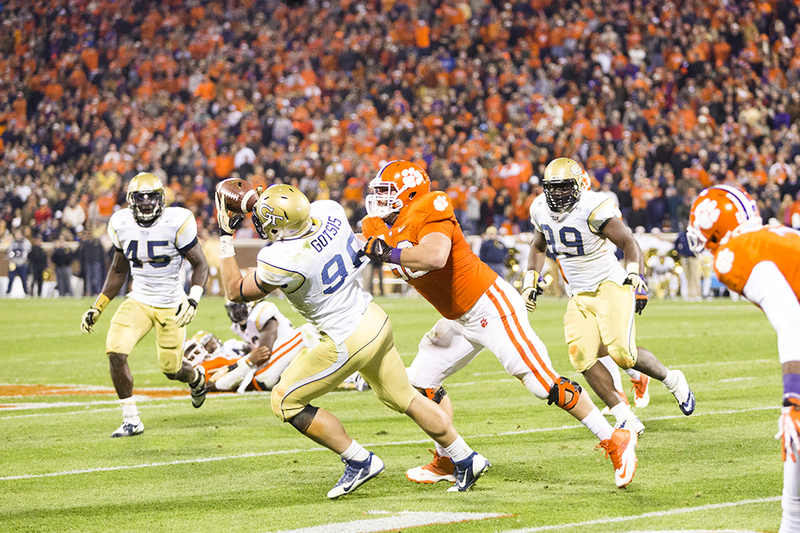 Vic Beasley anchors their defense and will most likely lead the ACC in sacks. 3. Louisville: This is Louisville’s first year in the ACC, and former head coach Bobby Petrino returns to Louisville after failed job attempts with the Atlanta Falcons and Arkansas Razorbacks. The Cardinals lost quarterback Teddy Bridgewater, but former coach Charlie Strong has left plenty of talent for the new coaching staff. 4. Boston College: One of the surprises of the ACC last season was Boston College with their impressive running game. Former running back Andre Williams has moved on to the NFL, but the talent in the program should be great enough for them to make a bowl once again. 5. Syracuse: The Orange had a rough go in some of their ACC games as first time members: Tech beat them 56-0 and Florida State and Clemson also won by very large margins. Still, the Orange made a bowl game last year but will have their work cut out for them to make it again. 6. NC State: The Wolf Pack struggled mightily on offense last year and didn’t win a game in ACC play. New quarterback Jacoby Brissett will be eligible this year after transferring from Florida and should run their offense more effectively than last year’s quarterbacks. 7. Wake Forest: Jim Grobe resigned as coach last season, and an entire new staff was brought in to rebuild. It should be a rough first season, and it will be surprising if Wake wins an ACC game. 1. Duke: The Blue Devils shocked the nation last year as they won a program-high ten games, and they are the favorites by most to repeat as coastal division champions. Quarterback Anthony Boone will look to improve on his 427 yard performance from the Chik-fil-A Bowl. 2. Miami: Miami fans have been waiting for what seems like forever to return to their national prominence, but it will not be this year. 3. North Carolina: The Tar Heels ended the season on a high note and will once again have plenty of talent in the program, but don’t expect that to lead to more wins as UNC frequently has underachieved in the past. 4. Georgia Tech: The Jackets could finish between first and sixth place in the coastal division, and much of their season depends on the health of offensive line and new quarterback Justin Thomas’ ability to run Paul Johnson’s triple option offense. 5. Virginia Tech: Logan Thomas is no longer quarterback which will thrill Jacket fans as he always found a way to play his best against Tech. The defense will once again be strong as there is a Fuller in the secondary. 6. Pittsburgh: The Panthers had a good first season last year, but many key players have graduated. Their power-running game with James Conner will be their biggest strength. 7. Virginia: Head coach Frank London is fighting for his job this year. After going winless last season, the pressure is on for Virginia to have a big season. If results aren’t produced, the Cavaliers will probably be looking for another coach for next season.